Six frame animation of Comet 41P moving through Draco. 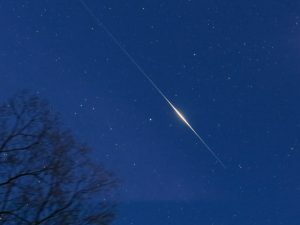 Iridium Flare that I caught on 4/24/17, at 8:35PM. One-minute exposure, 100mm f.l., ISO 1250. The satellite streaked through C. Ven. The bright star below is Alpha, the brightest above is Beta.